In Libya, it is virtually unheard of for a woman to die during childbirth. In fact, only 9 women out of 100,000 who give birth die from complications arising from childbirth. In Nigeria, maternal mortality is an everyday occurrence with as many as 145 Nigerian women dying daily from childbirth (1). While the world as a whole has taken giant leaps in curbing the menace of maternal mortality, sub-Saharan Africa and Nigeria in particular have continued to lag (2,3). In order to correct this, efforts have been made to understand possible underlying causes for this unacceptably high maternal mortality figures. Arising from the above, the causes of maternal mortality have been investigated exhaustively with results highlighting factors such as low contraceptive prevalence resulting in unplanned and uncontrolled fertility as being implicated in high rates of maternal mortality (4,5). It has been shown in several developed countries that if women are better able to plan their pregnancies, then the risk of maternal mortality can be significantly reduced (6). Similarly, contraceptive use can lower fertility rates in poor countries, thus stimulating economic activities, encouraging achievement of long-term national goals related to universal education, poverty reduction, and improved environmental conditions, which are all part of the Sustainable Development Goals (SDGs) (7,8). Studies have also shown that longer intervals between births help maternal and child health by allowing mothers time to recover from their previous pregnancy and delivery, and allowing surviving children more time for breastfeeding and less competition with other siblings over resources such as food and the mother’s time (8,9). In addition to the above, contraceptive uptake significantly reduces the risk of unwanted pregnancies and increases the average age of first birth among women. Child bearing at an early age entails substantial health risks for both the mother and the child (10,11). Being pregnant early in life is said to contribute to an estimated 70,000 maternal deaths worldwide annually among girls aged 15 to 19. An infant’s risk of dying is 60 percent higher when the mother is under 18 years of age compared to older mothers (12). Therefore, the importance of contraceptive use among women of reproductive age cannot be over-emphasized. In fact, the WHO describes contraceptive use as an important indicator in improving reproductive health globally. Thus, several efforts have been made by the government, national and international partners to improve the rate of contraceptive uptake within the country. 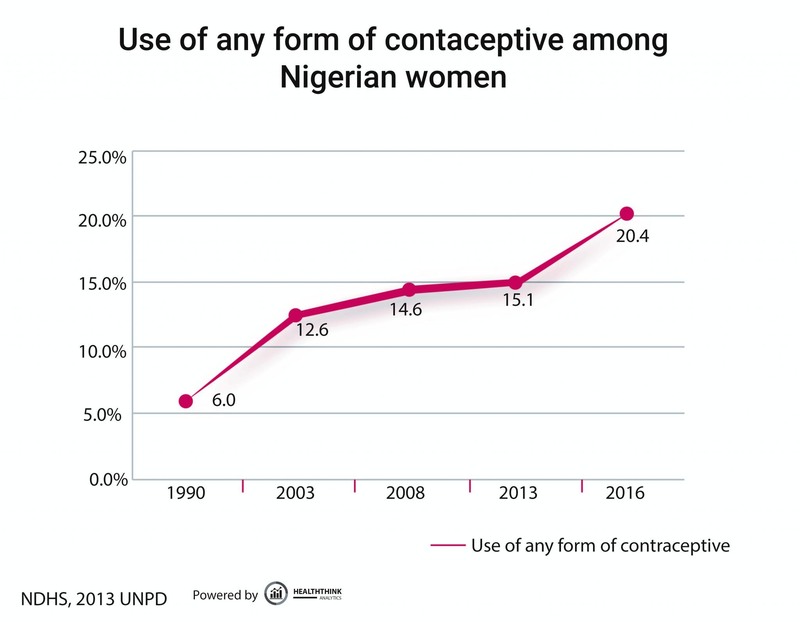 A cursory glance at the figures will give the impression of a satisfactory performance by Nigeria in terms of increasing the rate of contraceptive use in the country. For example, the 16% modern contraceptive prevalence rate (CPR) of 2016 is a 357% increase of the 3.5% modern CPR recorded in 1990, indicating that more three and a half times more married women than in 1990 now use some form of modern contraception. Similarly, the proportion of married/in-union WRA using any form of contraception doubled from 7.2% in 1990 to 14.4% in 2010 (1). When compared with a global increase of 15.5% during the same period, the growth in Nigeria could be deemed as very impressive (7). By 2016, it was estimated that this figure had increased to 20.4% in Nigeria (1). While these figures give an impression of rapid increases in contraceptive use, a contextual analysis of the figures give cause for a more sober outlook. For instance, among developing countries, excluding China, the total CPR as at 2010 was 54.1% while in West Africa, the figure was 15.1%. In Nigeria, it was 14.4% (7). In effect, Nigeria’s 2016 total CPR of 20.4% remains less than half of what developing nations as a whole had achieved as far back as 2010. Among its companions in the ten most populous countries in the world, Nigeria also has the lowest CPR as of 2016 (1). To further understand how dire the situation is, despite having the largest economy on the continent, as at 2010, Nigeria’s CPR remained behind all North African countries except Sudan, all Middle African countries except Chad and all Southern African countries (13). Such is the extent of Nigeria’s lag in contraceptive use. Even among its neighbors, Nigeria’s performance remains unsatisfactory as countries such as Ghana and Cape Verde had a total CPR of 68% and was 333% more than of Nigeria’s as at 2010. In fact, the difference between Nigeria’s 2016 CPR figures and that of Ghana has only slightly reduced to 50% (1,7). Considering the ‘big brother’ role Nigeria plays in continental matters, these comparisons become a source of shame to the country. 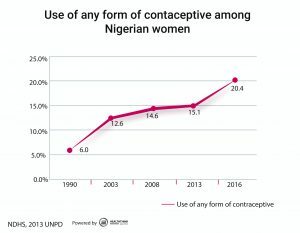 As a result of the above statistics, it has become obvious that all hands must be on deck in order to ensure that contraceptive use in Nigeria, at the very least meets up with global estimates. In order to achieve this, attention has been placed on the two major drivers affecting contraceptive uptake or the number of new users of contraceptive methods, namely demand and supply. 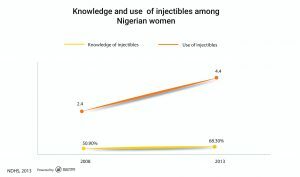 Demand for contraceptive involves the readiness of WRA to use contraceptives due to informed decisions. The demand side of contraceptive uptake in turn informs decisions about contraceptive supply (6). Attention has been given to the demand side of contraceptive uptake from government, donor programs and other non-governmental organizations through various demand-generating activities such as social mobilization through interpersonal communication, mass media and other slogans and logos worn at public events to reduce barriers, myths and miscommunications (6,14,15). The supply side of driving contraceptive uptake has also received much attention through several reproductive health initiatives over the past 5 years. In addition, research have highlighted unavailability of a wide spectrum of contraceptives at various primary health care centers (PHC), inadequate staff strength and knowledge required to administer modern contraceptive methods as major supply issues facing the country (6). In order to cater for these deficiencies, several interventions have been implemented in response to modified government policies to improve contraceptive supply especially at PHCs. Ensuring adequate stock of different contraceptive methods, training healthcare workers as well as exploring public-private partnership models are some of the supply-side innovations that have taken place in recent years in Nigeria (6,15). Government commitment to improving CPR in the country has also improved with the country agreeing to the London Summit on Family Planning, which promised to increase CPR in Nigeria to 36% by 2018. In addition, the Federal Government committed to adding $8.35 million annually to family planning representing a 300% increase (16,17). Within all these activities that are meant to drive contraceptive uptake in Nigeria, we now look at specific issues and trends which have cropped up recently and have the potential to shape the outcome of efforts of all stakeholders involved in the process. Some of these developments and their potential impact on Nigeria’s contraceptive use goals are now discussed. Perhaps now more than ever before has the problem of the North-South divide becom evident. Apart from political tensions, results of reproductive health surveys have shown ever-widening gaps in contraceptive use in the 2 main regions of the country. 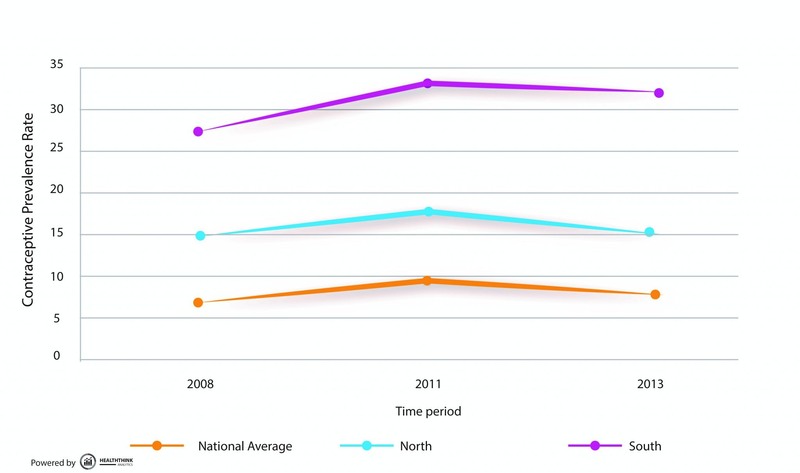 For example, Figure 1 show how the North-South gap has gradually but steadily grown between 2008 and 2013. Considering that the population of the North surpasses that of the South, this trend in CPR becomes even more worrisome. In an attempt to reverse this trend, the majority of reproductive health and family planning programs are focusing on the Northern region of Nigeria. Their impact, which cannot be ascertained now due to lack of zonal data for 2016 CPR figures, will be a key determinant in deciding whether Nigeria meets its 36% CPR goal in 2018. Nigeria has one of the highest adolescent populations in the world. While this statistic could be an indicator for potential exponential economic growth, this segment of the population has hardly been provided with the necessary tools to become meaningful contributors to economic growth. However, adolescents are major contributors to reproductive health issues faced in Nigeria (21,22). As proof of this, the 2008 National Demographic and Health Survey (NDHS) reports that 23% of teenage girls had begun childbearing (either had given birth or were already pregnant with their first child) (19). As at 2011, the figure had risen to 26.9% while the figure fell back to 22.5% in 2013 (18,20). Further complicating the case of adolescent sexual activity is the fact that the 15-19 age group is the least covered age group with respect to contraceptive knowledge and use. As at 2011, only 3.5% of this age group were using any form of contraceptive while in 2013, the figure had only increased to 6.3%. A breakdown according to marital status showed that more than one-third of sexually active unmarried teenagers were not using any contraceptive method (18). Several studies have brought to the fore the cultural and environmental problems sexually active but unmarried women in the Nigerian context face when attempting to access contraception. Social stigmatization, lack of confidentiality on the part of health workers and other reasons have been cited for this difficulty (23,24). 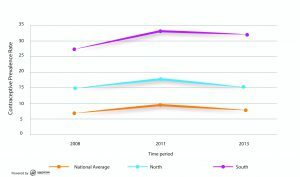 As proof, the 15-19 age group had the lowest met need for family planning as well as the lowest percentage of demand satisfied among WRA as at 2013, further demonstrating the bias against teenagers seeking contraceptive use (20). With the number of adolescent girls running into several millions, more attention must be given to creating more demand among this age group as well as ensuring that their need for contraceptive use is satisfied. Despite these challenges, all is not bleak with regard to the contraceptive situation in Nigeria. There are innovations that seem to gathering widespread acclaim for their efficacy and appeal to the Nigerian context. Two of these are now discussed. Due to the problems arising from the diverse cultural, social and religious constitution of the country, a very basic problem faced by stakeholders was finding suitable and acceptable contraceptive methods for the populace (25). While certain methods such as condoms and intra-uterine devices were accepted in certain areas and among certain segments of the population, it was virtually a taboo to mention them in other areas (26,27). Another problem that was common was how to deal with men who despite several attempts, refuse to allow their wives use contraceptives. Physical methods such as the condom were a no-no, while continued infertility from more permanent methods such as the IUD would lead to suspicion and possible expulsion of the woman from the home (28,29). In came a new type of short-acting, effective contraceptives known as injectables. These contraceptives are taken just as any injection and are usually short-acting, therefore satisfying the need of spacing. In addition and probably more important in certain areas, is the fact that these injectables do not require any special tools to administer (30). 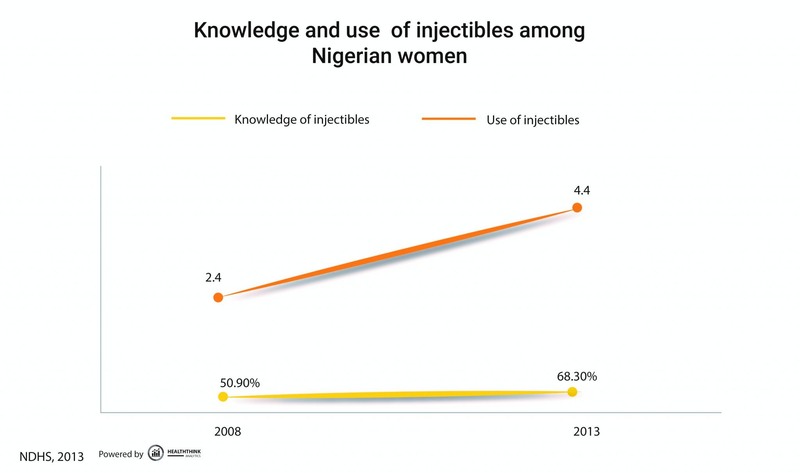 That Nigerian women are embracing injectables is evident in its use as the preferred contraceptive method among women nationwide (31) In 2008, only 50.9% of all women knew about injectables and 2% of WRA using them. However, as at 2013, the proportion had risen to 68.3% and 3% respectively. Just 3 years later, the proportion of WRA using injectables has almost doubled to 5.6% (19,20). These figures are expected to rise even more exponentially with the introduction of a new type of injectables- the self-injectables. As of now, Sayana Press is the most common of these self-injectables. These new set of contraceptives are even more appealing to WRA because they can be used by women themselves without visiting a health facility. Thus, especially among sexually active women, this method protects them from the social stigmatization attached with sourcing contraceptives at health centers (32). Results from pilot studies have shown that this new method shows much promise and is expected to further boost Nigeria’s CPR within the next 2 years (32,33). Nigeria has been identified as one of the 57 countries facing human resources for health (HRH) crisis (34). 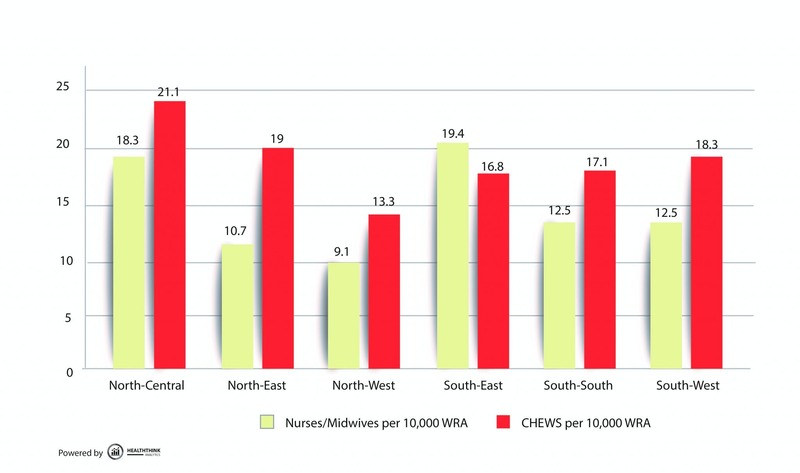 With approximately only 0.4 doctors, 1.6 nurses, and 0.2 Community Health Extension Workers (CHEWs) per 1,000 people, Nigeria faces a chronic HRH challenge (16). 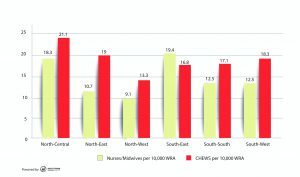 As if this is not enough, these HRH in the country exhibit severe regional and geographic differences with the South and urban areas having far more HRH than the North and rural areas respectively. In several rural areas, there are neither any doctors nor nurses, with only CHEWs available. Hitherto, only doctors and nurses were allowed to administer any form of family planning method or contraceptive. What this implied was that in areas lacking health staff of this cadre, administration of family planning was simply impossible unless WRA were ready to travel significant distances. Considering the poverty level and low decision-making abilities common among these women, this was not an option. As a result, the Federal Government’s decision in 2014 to task shift the provision of short-acting contraceptive methods to CHEWs was lauded as a milestone in Nigeria’s journey to increased contraceptive use (6,16). In many areas, these CHEWs remain the only HRH available. In addition, since these cadre of health workers are expected to spend up to 40% of their work hours in the communities, they are usually closer to the community members and find it easier to introduce and distribute contraception to community members (35,36) Furthermore, their familiarity with the terrain and people usually result in reduced resistance and apprehension from other stakeholders such as community leaders, religious leaders etc., making them more useful as Direct-To-Consumer (DTC) channels in such areas . The initial results are also positive, with several CHEWs receiving training in administering and distributing condoms, injectables and pills. Some early results show that contraceptive methods have penetrated deeper into communities due to the activities of these CHEWs (33). As with injectables, it’s still early, though, to assess the full impact of these health workers in improving access to contraception. Nigeria has always promised much but delivered so little in terms of improving maternal health and increasing contraceptive use. Statistics over the past decade remain damning as the country has failed to live to its billing as the ‘Giant of Africa’ in contraceptive uptake with several other African counterparts surpassing it. This situation remains appalling considering the importance of contraceptive use to improving health and to a broader extent, economic and social status. The reasons for Nigeria’s poor performance are several, with some recurring issues continually hindering efforts. However, newer issues such as widening North-South divide and increasing adolescent sexual activity accompanied with poor contraception coverage have emerged. These issues require special attention if they are to be prevented from hindering Nigeria’s progress. However, some developments, such as the introduction of new, more acceptable contraceptive methods and the task shifting of contraceptive administration and distribution to CHEWs have shown that Nigeria, with continued determination, can match its peers on the global scene. Skinner JS. NIH Public Access. 2013;255(1):1–5.